So, we are still rather inundated with bananas. 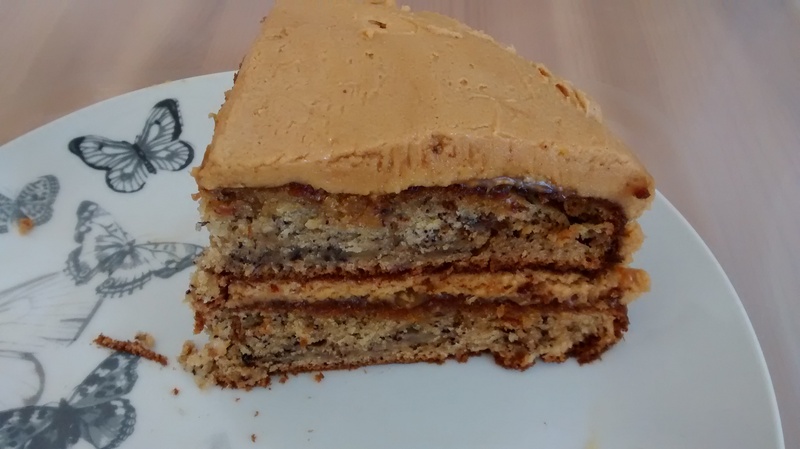 Last weekend I was flicking through my new CCC book, A Year of Cake, and came across Peanut Butter and Caramelised Banana cake. It sounded good, but the ingredients list was long, and despite trying a few recipes I always go back to the banana bread from the original CCC book. So I made a bit of a recipe mash up (get it?). Preheat the oven to 180C. Line two 20cm cake tins with baking paper (I buy the circles now as that is so much easier). If making the icing you may want to leave out the butter so that it has plenty of time to come to room temperature before you need it. Mash the bananas. Put the milk in a jug and add the lemon juice. Leave while you make the batter. Beat together the butter and sugar, then add in the peanut butter and beat. Add the eggs once at a time, then add the vanilla. Pour in the milk (the lemon makes it curdle slightly, so it might be a bit lumpy) and bananas, and mix well. Finally fold in the flour and bicarb. Pour into the two pans, and bake for 25-30 minutes, until a skewer inserted into the centre of each cake comes out clean. Leave to cool in the pan for a few minutes, before removing from the tin (leave in the paper) and placing on a rack to cool. Beat together the butter and peanut butter until creamy. Slowly add in the icing sugar and finally add the vanilla. If it is really thick, add a tbs of milk to thin it out. The recipe for the cake with the frosting also had bananas on top, caramelised with a blow torch, but I felt like it had enough banana flavour in there already. I had some of that lovely marshmallow deli vegan butterscotch sauce, so when I put the cake together I spread a bit of the sauce on the bottom cake, then half the frosting, put the other cake on top, and repeated with more sauce and more frosting. We had some on Sunday for tea and it was so good! The peanut butter frosting is just amazing, and luckily the banana bread-style cake is not too rich, so they go together perfectly. I normally add dark chocolate chips to the banana bread, but I think I might be converted to peanut butter instead. There was some left over so we took it home and are saving it. To continue the peanut butter love I made some peanut butter cookies- I was visiting a friend and one of my friends does not eat gluten, so I had a quick google and found a recipe here on the Wholefoods site. I made half with white chocolate chips, and half without as I didn’t think they were gluten free. They were so easy to make- I just whisked the egg in a jug, added the vanilla and sugar, whisked again, then finally added the peanut butter. 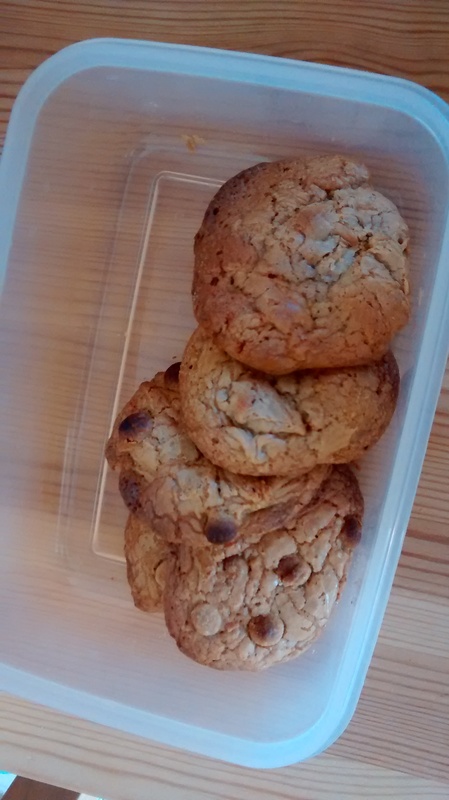 Some reviews on similar recipes said they were too crumbly, but these were perfect- nice and soft with a very strong peanut butter flavour. A slightly quicker recipe than the cake! Do you go for smooth or crunchy peanut butter? I always used to prefer crunchy but because smooth is easier to use in baking I tend to go for that now. Peanut butter frosting? Wow. I would happily just eat that out of the bowl without the cake. Ya know, to save on calories haha. Yeah, it would be pretty good by itself too! Both cake and cookies look really good, as usual! I’m always so impressed by your baking – the fact you can kind of ad lib a recipe just amazes me. I have to literally stick to the letter (and still it will probably not go right…). Does the lemon juice and milk make buttermilk? I’ve seen buttermilk in recipes before but never found where to buy it and googled it and it said mix lemon juice with milk. Just wondered! Well thank you! The recipe I followed was fairly similar- I used different flour (because that is what I had), more banana and an extra egg, because cake recipes seem to have more eggs than loaf type ones. I think so long as you don’t change too much it should be OK. Yes, the milk and lemon does the same as buttermilk- you can buy buttermilk- I’ve seen it in Waitrose I think anyway- but it always seems a waste to me- in things like red velvet they always have buttermilk as an ingredient but I just use milk and lemon (the acid reacts with the bicarb to make bubbles so it makes a very light cake). The CCC banana bread recipe just has milk and lemon juice, and that’s always been fine so I always just use that. That looks so good! I am a bit peanut butter fan – I don’t mind if it is smooth or crunchy. Every time I see one of your recipe posts, it reminds me that I really do need to christen our kitchen for baking. I haven’t done any since long before we moved. Next Next post: Hooray! Finally a run!